Director, producer, and actor Sydney Pollack left behind a substantial body of work. Starting as an actor in the early days of television, he soon moved behind the camera, directing episodes of such classic shows as The Alfred Hitchcock Hour, Ben Casey, and The Fugitive, before turning to films. After meeting Robert Redford while both appeared in the movie War Hunt in 1962, they established a deep friendship. Pollack began their professional collaboration when he cast Redford in This Property is Condemned (1966). The long and fruitful collaboration yielded many of their best known films, including: Jeremiah Johnson (1972), nominated for the Palm D'or at Cannes, The Way We Were (1973), Three Days of the Condor (1975), The Electric Horseman (1979), Out of Africa (1985), for which he received an Oscar for Best Picture and Best Director, and Havana (1990). He had returned to acting in recent times, starting with his role as Dustin Hoffman's agent in Tootsie (1982). 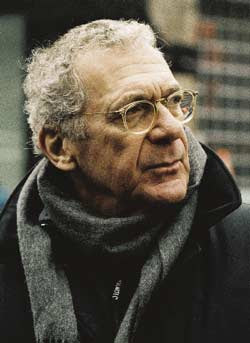 If he wasn't appearing in his own films, he usually saved his appearances for movies where he'd work with other prominent directors like Robert Altman's The Player (1992), Woody Allen's Husbands and Wives (1992), and Stanley Kubrick's Eyes Wide Shut (1999), as Victor Ziegler, a memorable role which he only got after Harvey Keitel, the original actor cast, could not return for reshoots due to other commitments. As a producer, he was involved with such notable films as The Fabulous Baker Boys (1989), Sense and Sensibility (1995), The Talented Mr. Ripley (1999), Michael Clayton (2007), and even the recently reviewed HBO film Recount (2008). No doubt because of his own experience as an actor, he was known as an actor's director, directing no less than a dozen actors to Oscar nominations, like Jane Fonda, Barbra Streisand, Paul Newman, Dustin Hoffman, Meryl Streep, and Holly Hunter. Two of those actors, Gig Young and Jessica Lange, won for They Shoot Horses, Don't They? (1969) and Tootsie, respectively. Tootsie is ranked 69th on the American Film Institute's list of the top 100 films of all time. He died this afternoon at the age of 73.